EDMONTON (October 4, 2016) – All Weather Windows will be part of Habitat for Humanity Canada’s biggest build project ever. Habitat for Humanity’s 34th Jimmy and Rosalynn Carter Work Project will be taking place in every province and territory across Canada with a goal to collectively build 150 homes to mark Canada’s 150th anniversary of Confederation. Former U.S. President Jimmy Carter and his wife Rosalynn, will be visiting Canada from July 9-14, 2017, focusing their efforts in Edmonton, Alberta, and in Winnipeg, Manitoba. Habitat Canada has a long history of creating affordable housing opportunities in the country. People living in Habitat homes not only help to build their own houses, they also pay affordable mortgages. Habitat for Humanity’s innovative approach helps working families on a new path to better, affordable living conditions that lead to improved health and stronger childhood development, as well as a decrease in reliance on food banks. 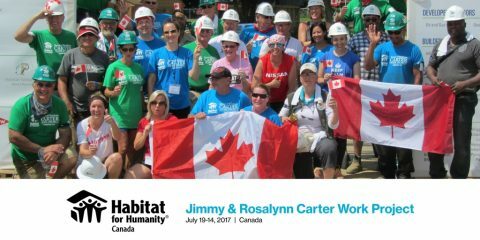 To donate or learn more about the 34th Jimmy & Rosalynn Carter Work Project, please visit http://habitat.ca/cwp.